Civil War Reenactors South Confederate States CS Soldiers Cast Brass Belt Buckle. 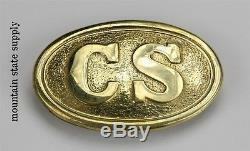 New reproduction Civil War "CS" Confederate States belt buckle. Made of solid cast brass. 3-1/4" wide by 2-1/8" tall. See my other listings for more Civil War reproductions. The item "Civil War Reenactors South Confederate States CS Soldiers Cast Brass Belt Buckle" is in sale since Sunday, February 23, 2014. This item is in the category "Collectibles\Militaria\Civil War (1861-65)\Reenactment & Reproductions\Uniforms". The seller is "mountainstatesupply" and is located in Ripley, West Virginia. This item can be shipped worldwide.